July 2, 2012, filed under Running; Comments Off. February 16, 2012, filed under Sand Dune Park; Comments Off. At its October 18, 2011 meeting, the City Council recognized that, after one year of collecting data, the Sand Dune was operating at less than 45% of capacity and dropping. During this meeting and thanks to all of your emails, additional lunch and Saturday hours, as well as a monthly pass for walk up usage were enacted. Consistent with the last 1.5 years, there have been no serious issues associated with the additional dune hours. At the time, the City Council also indicated that they were in favor of adding morning exercise hours to accommodate working residents and asked the Parks & Recreation Commission to add morning reservation slots and consider Sunday hours as well. Although the Parks & Recreation Commission declined to suggest possible times for either weekday morning or Sunday slots, at this Tuesday’s City Council meeting the addition of weekday morning & sunday slots will be considered. Since the staff report does not suggest possible hours, CORE will present the City Council with recommended hours (see below). If these options appeal to you, it is important that you attend this Tuesday’s city council meeting, (February 21, 6:30 PM at Manhattan Beach City Hall). Or at the very least email city council with your request (again, always include your Manhattan Beach address) at CityCouncil@citymb.info and you can also cc: jake@core4you.org & bill@core4you.org . The emails were instrumental in the council’s decision to add additional reservation slots. Since there is still a maximum of only 20 per slot, it is CORE’s position that these new usage opportunities will enable local residents to use the Dune more often without impacting the neighborhood. As you may know, these rules may not be revisited for several years, and this is your best opportunity to make your voice heard on this issue important to our hearts (pun intended). If the weekday morning hour and Sunday hours are added, CORE does not expect to take the lead role in pushing for any additional changes since we would like to put this issue to rest and simply enjoy our park. As usual, we encourage you to send constructive comments and suggestions to city council, CityCouncil@citymb.info . December 28, 2011, filed under Running; Comments Off. December 22, 2011, filed under Running; Comments Off. December 18, 2011, filed under Running; 2 Comments. December 11, 2011, filed under Running; Comments Off. 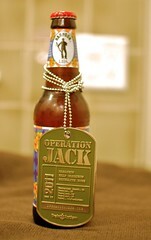 So you all remember the 2010 Operation Jack Marathon, right? You can check my recap on the CORE blog. And watch the great video reviewing the race and Sam’s epic achievement of running (and running HARD) 61 marathons in 2010. 1) Enter one of the satellite races. We have an awesome medal for 2011, 4″ die cast metal. And an excellent t-shirt and stellar bibs. Want to get all 3? 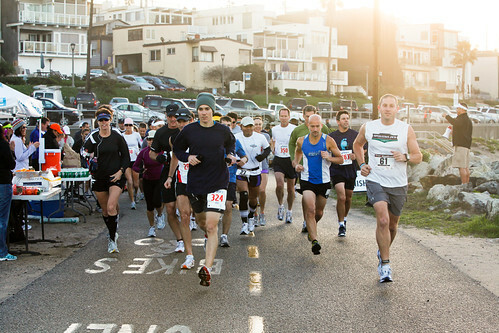 Sign up for the 2011 satellite runs, 6.2 miles. Just register by December 16 for $35 to get all the gear by race day. You can read more about the satellite runs on Sam’s blog and then register to run as part of Team CORE. Choose the Satellite Run option. 2) You can also donate through my fundraising efforts. I’m matching the first $5 of every donation and another $5 for each runner on Team CORE. If you donate $25 or more through me, you’ll get a t-shirt too (just remind me). For LA locals, there’s still time to register to run or sign up as a volunteer. December 1, 2011, filed under Running; Comments Off. 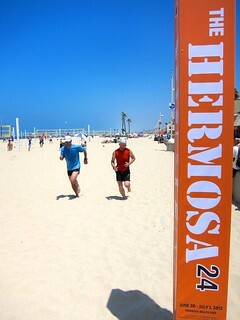 Registration will take place at the start line, adjacent to the north end of the El Porto parking lot. Registration will begin at 6:00 AM and will continue until shortly after the race begins. Late registration may be available, cash or check only please. 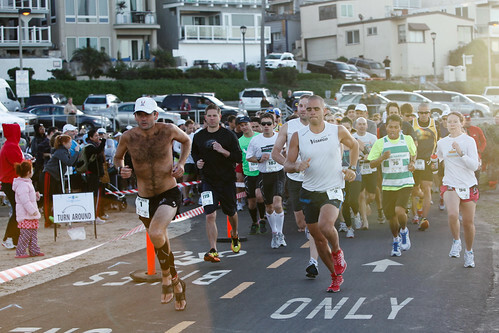 The entire race is run along the South Bay & Ballona Creek Bike Paths. Runners need to share the road with cyclists, joggers, skaters and walkers, so please bear right while running. Before the race start, do not block the bike path as many cyclists will be passing through before the race starts. At about 7:25 we will ask runners to line up by expected pace on the bike path. The first mile of the race will be very crowded and there is not a lot of room to pass. Follow race instructions, and make sure that you line up according to estimated pace to avoid being trampled or elbowed during the start. 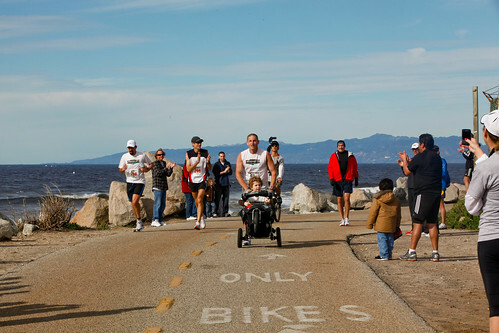 Within the first mile, race volunteers will ensure runners stay on the right half of the bike path. Follow all instructions from race organizers. The race is essentially flat, with the biggest obstacle a 20-foot hill. There are aid stations at the start, 2.3, 4.7 & 6.5 miles where water and Gatorade will be available. Energy gels will be provided at the 6.5 mile aid station and at the start/finish for marathoners. There are restrooms for the first & last 4 miles of the out & back course. As noted above, the bike path is open, so share the path with the cyclists, skaters, walkers & runners enjoying their morning exercise. There are only two forks along the route. 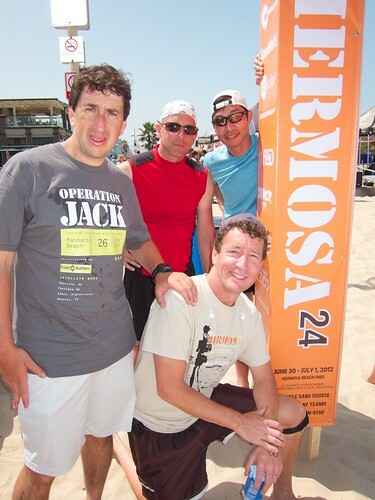 The second aid station, at mile 4.7, is at the entrance to Ballona Creek. On the way out, turn right and 100 feet later turn left to go over the bridge, then turn right and run along the jetty. Continue straight, staying on the Ballona Creek bike path and do not turn left towards Venice. You can view more of the course detail at MapMyRun. There will be food & snacks available after the race, as well as a short awards presentation for the top 3 male & female finishers in each race. Plenty of food is available nearby, with a couple dozen restaurants on Highland Ave. between 33rd St & 45th St.
Additional donations are welcome! 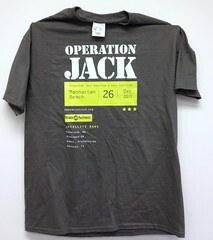 Please visit http://operationjack.org/ and click “DONATE NOW!” or visit http://ojmarathon.kintera.org/ and support your favorite runner. 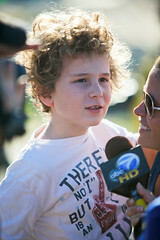 November 30, 2011, filed under Sand Dune Park; Comments Off. Following CORE’s recent campaign to expand dune access due in large part to dozens of emails sent by dune users, the new rules for the dune are now in effect. The big benefits are that seniors can use the dune w/o reservation if space is available and there are 7 additional time slots each week. There is also a new “monthly pass” which costs $25/month and allows walk-up use ony if there is available space on the dune after 10 minutes. A side effect that reservations may not be honored if the patron does not show up within the first 10 minutes. This falls short of the promising improvements the council supported at the recent meeting. The council members indicated that they wanted to allow walk-up reservations, and we’re obviously not there yet. Thankfully, there are 2 upcoming opportunities to make your voice heard on this subject. On December 7 & 14, the Parks & Recreation Department will hold 2 community workshops to discuss improvements to dune access. It’s important that dune users show up in person to these meetings, otherwise your voices may not be heard. On the agenda are the addition of when to add hours weekday morning (which the council unanimously supported) and Sunday time slots. In addition, there will be a discussion about what to do about a permanent fence. CORE still stands against fencing in the dune– as one supporter asked, what color fence would you build around the Grand Canyon or Yosemite National Parks? Resident Support Leads to Expanded Dune Hours! October 20, 2011, filed under Sand Dune Park; 1 Comment. Congratulations all, because of the suggestions offered by CORE supporters and other residents following our last blog post, the City Council heard your voices & unanimously voted to expand dune hours, allow walk-up reservation with a permit & allow seniors to enjoy the dune without reservations. These changes, while modest, go well beyond what was recommended by Park staff. In addition, a group of neighbors & dune users will form a committee to explore adding more hours. Both the Daily Breeze & the Easy Reader both have stories with some more background & detail. Walk-up use for seniors– it’s unclear if this is during all open hours or just during the fixed time slots. Walk-up use for up to 50 people that purchase or otherwise obtain a monthly pass. The cost of the permit and procedures for using it have not been announced yet. Walk-up reservations for all, enabled by staff using wireless technology. Hey, if tech savvy folks can help staff with this & demonstrate it to staff & council, we can make this happen sooner rather than later. Look for updates on the reservations page and the city’s official page for the dune. And you can still email city council with ideas for improvements, praise for park staff or anything else. What has been a big part of the success of the CORE campaign has been the positive engagement of so many dune users, led by the example of partner-in-crime Bill Hory. From the outset, Bill’s philosophy has been to understand the issue from all sides and work through the City Council process, even if it seemed slow at times. The benefits of this approach have not always been immediately visible, but they were on full display this week. By building a broad coalition, CORE members were able to send dozens of emails to the city on short notice, undoubtedly steering the expansion of dune access well beyond that recommended by staff. It wasn’t only CORE supporters of course. Some dune neighbors emailed and even spoke at the city council meeting encouraging staff to add more hours. It’s hard to overstate how crucial that support was. So thanks to all CORE supporters and dune neighbors that contacted City Council to advocate for expanded access. October 15, 2011, filed under Sand Dune Park; 1 Comment. This Tuesday, October 18, the dune at Sand Dune Park will once again be on the City Council agenda. City statistics show that in the last 12 months, dune usage has fallen 80-90% and the dune has been replenished only once, which is less than half of the usage anticipated by the city. The number one reason for this are the restrictive hours that make it very difficult for working adults to exercise on the dune. The city has proposed only the minor change of adding one more reservations slot during mid-day to accommodate people on their lunch break. While we support that measure, it still does nothing to help the thousand of Manhattan Beach adults that commute to work each day. The dune is not open until 8 AM and closes at 7 PM in the summer, and 4 PM in the winter. 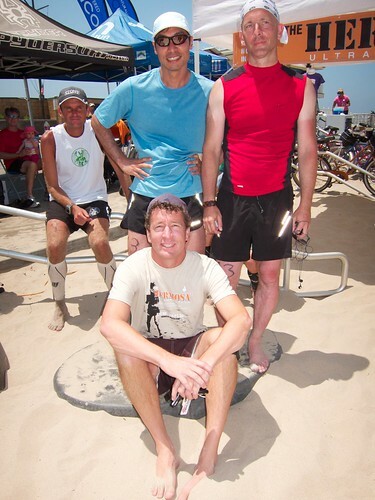 Closing so early in the winter is unfortunate, as winter nights are perfect for exercising in Manhattan Beach. CORE’s proposal to modestly extend hours is included below. In addition, city staff proposes spending $50,000 or more to build a permanent fence around the dune. 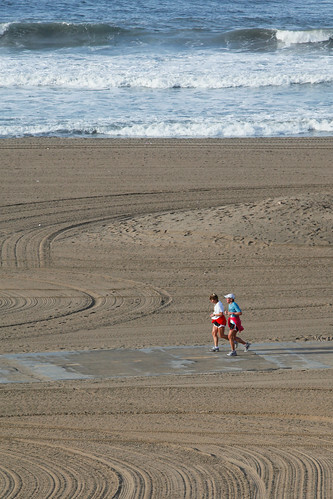 Finally, statistics show that only 15% of dune reservations are made by city residents; CORE believes this is because spontaneous usage has been eliminated, which is how most Manhattan Beach residents enjoy the dune. Allow walk-up use during regularly scheduled times if fewer than 15 reservations have been made. Defer building a permanent fence, and instead use the money to support important Parks programs such as the fixing of the Begg Pool. I understand that you are reviewing the management of Sand Dune Park at your Tuesday, October 18 meeting. I am writing to strongly urge you to support the CORE proposal for Sand Dune Park. The plan addresses the major issue with the current rules at Sand Dune Park, specifically the near inability of working adults to regularly exercise on the dune or spontaneously enjoy this crown in the city’s park system. Since the dune has been used less than half as often as targeted by the city, there is ample capacity to allow more time slots. By modestly extending dune hours just 30 minutes in the morning and 30 minutes in the evening and allowing spontaneous midday use, this will make it much easier for working residents to enjoy the park. 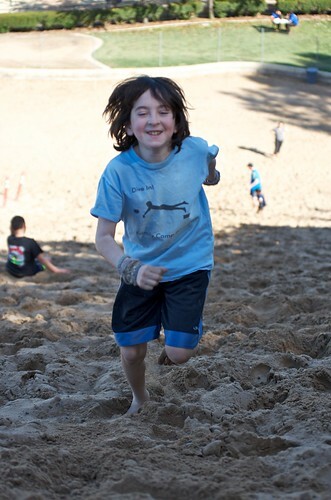 Allowing children & adults to play & exercise on the dune during winter evenings would be a welcome benefit as well. Adding weekend slots is another way to improve access for residents.